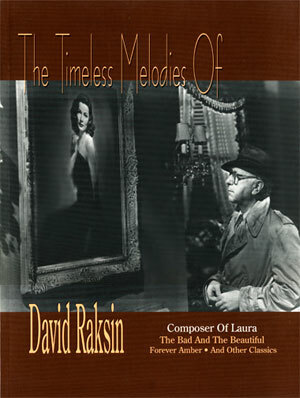 Had David Raksin written nothing but the immortal "Laura," it would have been measure enough of his incomparable talent for melody and harmony. But the composer of scores for such Hollywood classics as Forever Amber, The Bad and the Beautiful and Separate Tables had also written a treasure trove of songs. He shared his favorites in a collection called The Timeless Melodies of David Raksin. Originally published by Ekay Music in 1996, this extraordinary 112-page, 9" x 12" collection of sheet music has long been out of print and hard to find. A number of years ago, Raksin donated a few copies of this songbook to The Film Music Society for fundraising, and we are happy to offer them for purchase while the supply lasts. Each song was arranged for piano by Raksin, who oversaw the compilation and publication of the music. This wonderful folio is filled with his personal commentaries and anecdotal material as well as rare photographs and images. Selections include lyrics by such noted collaborators as Johnny Mercer, Marshall Barer, Jay Livingston and Ray Evans, and a few by Raksin himself under the nom de plume John Sartain, Jr.
Our stock is small, so contact us early before they sell out! There are 20 copies available at a price of $50 each for members and $75 each for nonmembers. We also have an additional 8 copies autographed by David Raksin at a price of $75 for members and $100 for non-members. (Shipping/handling is extra.) Sorry – only one songbook per person! Orders can be placed by phone, fax, mail or e-mail. Your purchase price minus $20 is tax-deductible as a chartible donation, and you will receive a letter of donor confirmation. And if you would like to become a member of The Film Music Society, please visit our Membership page and read about how you can help support film music preservation!